At the University of Florida, over 100 vestibular schwannomas are treated yearly. Open surgical and radiosurgical methods are the mainstay of treatment, however, medical therapies are occasionally used. The benefits and risks of each of the different treatment alternatives is carefully reviewed with each patient so that they can make a well informed decision about which treatment would be best for them. Acoustic Neuromas are benign slow growing tumors arising on the nerves of hearing and balance. The common name is a misnomer as this tumor most commonly originates from vestibular nerve, a component of the vestibulo-cochlear nerve bundle, also known as the eighth cranial nerve. Additionally, the tumor type is schwannoma, rather than a neuroma. Thus, the correct name is vestibular schwannoma. The diagnosis is often confirmed with an MRI scan of the brain utilizing contract enhancement. The scan will allow evaluation of the exact tumor location, size, and involvement of adjacent brain structures. Additional tests, including a hearing test, may be necessary for complete evaluation. Only rarely do vestibular schwannomas pose any immediate threat to life. Some of these tumors may remain dormant or grow slowly over many years and some small tumors can be observed without treatment. However, most VS should be treated especially if there is documented evidence of growth or if the tumor is causing a significant neurological, usually of hearing or vestibular function. There are several operative approaches which can be taken to remove the tumor. The middle fossa approach is directed above the ear under the temporal lobe of the brain, and is sometimes selected for very small tumors. Another approach, the translabyrinthine approach, directed behind the ear through the mastoid to the area under the brain, destroys hearing and is not suitable for patients in which there is the opportunity to preserve hearing on the side of the tumor. The translabyrinthine approach is not suitable for very large tumors. The third approach which we most commonly select, called the retrosigmoid approach, is directed through the area behind the ear. We utilize this approach because it is suitable for all size tumors, small or large. The retrosigmoid approach offers the potential for preserving hearing in every patient, although hearing preservation can be achieved on the side of the tumor in only about one-half of the patients who have small tumors and good hearing. 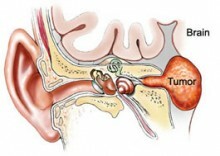 It is infrequent that hearing can be preserved on the side of the tumor in patients with large tumors. Another risk of acoustic neuroma treatment is facial paralysis. We feel that the retrosigmoid approach offers the best opportunity for preserving the facial nerve, a goal which can be achieved in most operations. Over the past decade, another treatment approach, called radiosurgery, has become increasingly popular. Radiosurgery is an outpatient procedure which starts with the attachment of a “head ring” under local anesthesia. After detailed computer planning, hundreds of very small radiation beams are focused on the tumor. The treatment involves no incisions and requires no recovery time. Long term tumor control rates are quite high and the risk is very low. Over the past several years, a third treatment approach, a medical therapy using an intravenous medication called Avastin (Bevacizumab), is being used in certain patients. In several small studies, this medication has been shown to improve hearing, reduce tumor size, and delay the time until need for open surgery in certain patients. This is reserved for either: 1) patients not felt to be ideal candidates for either open surgery or radiosurgery or 2) patients desiring to pursue a medical therapy. More information regarding medical therapy for acoustic neuroma and Bevacizumab can be found below. For information about clinical research being conducted at the University of Florida in the areas of treatment, education, support, prevention and diagnosis, please our clinical trials web page.